3 days in now, and not past page 1. I am trying to configure Scribus the way it's recommended and it's becoming tedious now, so I'd appreciate some help on colour management. Firstly, all my images are taken in Adobe RGB RAW. They're converted into sRGB JPG's. I run Windows 7 therefore there is no dedicated profile for my monitor, and although I have a calibrated profile, it makes no difference whether I use that or the standard sRGB profile. So as default I use the sRGB IEC-61966-2.1. It's this profile that is embedded in my images. In Scribus the colour palette selected is Scribus Basic, black. I selected the sRGB IEC-61966-2.1 profile in Scribus, with the Intent as perceptual, however most of the darker areas in the image still come out green, which I'm told is an out of gamut warning. So, right now I'm a bit stumped, still on page one, and can't move forward until this issue is resolved. Again, I'd be grateful for suggestions. Re: Is using colour management worth it? Unless you have a calibrated and profiled monitor and have fixed ambient light conditions in your room, you are better off not using color management. Color management is used to make sure that what you print looks as close as possible to what you see on your monitor, but that assumes you have a correct profile for your monitor. There are a lot of different profiles involved in color managament, from what your write I can not see what printer profile you use. The out of gamut warning means that the color can not be reproduced by the printer, thus it can only come from a printer profile. So, I need a printer colour profile to use instead? Not instead... You need several profiles. You need at least one (RGB) profile for your monitor and one (CMYK) for your printer. Norman Korens pages on color management are good. Read them. it really won't be easy to get everything correct at the firs try! what i can suggest you is to do some work, post it for review and iteratively fix things. for your first work you also may try to be rather conservative in the choice of your colors, fonts and shapes... this will make it more likely that the result will look ok when printed! OK I can't pretend to know all about colour management, but I understand enough to know that I set a separate profile for monitor, printer, and screen. I have used Windows inbuilt calibrator to make a profile for my monitor, chosen sRGB IEC-61966-2.1 for the image itself as that is the profile embedded, and Euroscale Coated V2 for the printer. Still my image is mostly green in the dark areas, and all text comes out green. Turning off colour management makes it view as it should, but turning off colour management defeats the object of using Scribus to build a quality file anyway. What would be the purpose of not using colour management? I might as well use Publisher then. So, I have selected appropriate colour profiles, but the out of gamut is showing most of the dark areas of my image, and even when I turn the out of gamut warning off, it still shows the same? Color management is not something you just "turn on". For color management to work as intended, you need to know what you are doing. I also thought it was better with decent profiles even if you did not have perfect profiles. But the more I learned, the more I understood how hard color management is. You can not get a good profile for your monitor without measuring it, because the profile tells which RGB value gives what color. And you can not know that without measuring the color. The profile is a "mapping" between numbers (RGB or CMYK) and "real colors" (as defined in eg. CIELAB). With simple "eyeballed" profiles you don't know if the mapping is correct. 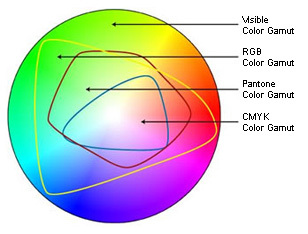 Also, it is important to understand that there are a lot of colors in RGB that can not be reproduced with CMYK. Look at the gamut comparison chart here. Profiles are not static. A monitor needs regular recalibration (I think professionals do it several times a year). A printer profile is only valid for the paper and ink it was made with. With an inkjet you should (if you want it to be perfect) make a new profile when you change ink cartridge. Well I've grasped the basics, thanks to some of the links in here pointing to some excellent articles on the subject. I think it's one fo those things where you provide what you can and leave the rest to the printing man, as he'll know the rest. However, that doesn't help me with setting up Scribus. I have got colour profiles at least for now, 1 embedded in the image, 1 for the monitor and 1 which is a catch all for print houses. They may not be the most accurate, but I don't understand why Scribus is continually giving me out of gamut warnings. Especially for the text which is red, which is one of the most basic colours. Perhaps even with Windows 7 I still need to use LittleCMS? What does the printing man know about your monitor? The printing man knows nothing about my monitor, that's why I have a printing profile. I'm not sure what you point is there? If I've done something wrong I'd love to know, as this is day 5 and still the out of gamut warning shows on page one, so I'd like to get it sorted before starting properly. I know there's lots to learn about colour management, but I think I'm correct in saying Scribus is set up to manage this, and all I need are appropriate profiles in place. If that is indeed the case, then I've done that, so I must have made an error somewhere, which is why I'm here trying to find out what it is. You are misunderstading the "direction" of the use of the color profiles. The monitor and printer profile are used to make your monitor show (as close as possible) how the printed result will look. The color management does not really affect how the printed result looks, if you turn off color management it will still look the same printed, but the display on your monitor might differ from the printed result. Yes I get that. So the fact that the out of gamut is constantly showing, means it's not showing on my monitor how it would print. So there's a mis match. Which is what I've spent 5 days trying to figure out. But not we're actually going in circles. No programme should be this difficult to use, no matter what you're trying to achieve. In all my years using IT I've not found one where the initial setup is out of reach of success. I think it's time to move on and try something else, but I appreciate all the time you guys have spent with this. Color management works the same in every program, be it Photoshop, Indesign or Scribus.